It was the fall of 1984 and I was a sophomore at Duke University. My boyfriend Mark had just graduated but was uncertain about what he wanted to pursue as a career, so he opted to extend his summer job as a driver and mover for a local moving company while he pondered his path and his future. In addition to being Deadheads, Doug and Toni were also Krishna devotees, so Doug sometimes wore traditional Indian clothes to the office and donned a tilak (ash mark) on his forehead. In their Durham warehouse, incense smoke wafted in the air and shoes were stashed at the front door. Tapes of the Dead played all day with occasional interludes of Krishna chanting. We knew to be quiet upon entering the warehouse whenever chanting was heard. 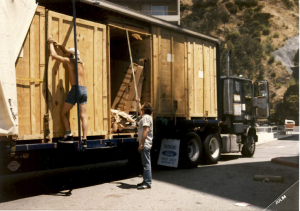 While I made my way from Philosophy to Japanese to Geology classes at Duke, my beau mastered the art of loading and driving an 18-wheeler. The large truck had just been added to their fleet of smaller vehicles and Mark was the first employee to get a big rig driver’s license. It wasn’t easy. Maneuvering such a large truck was one thing, but there were also 12 gears and a very specific approach to braking. (If you’ve ever seen runaway truck ramps, that’s what they’re for, braking problems.) Mark had to know about the truck’s mechanics and followed a regimented checklist before each trip, just as a pilot does with a plane before taking off. He also had to know what to expect at highway weigh stations and how to address any issues that might arise there. Truckers also used the CB to comment on motorists, looking down from their high perches into neighboring car windows and taking note of what they saw. Approaching truckers would be told to watch out for the chick in the blue skirt in the brown Toyota, for example. 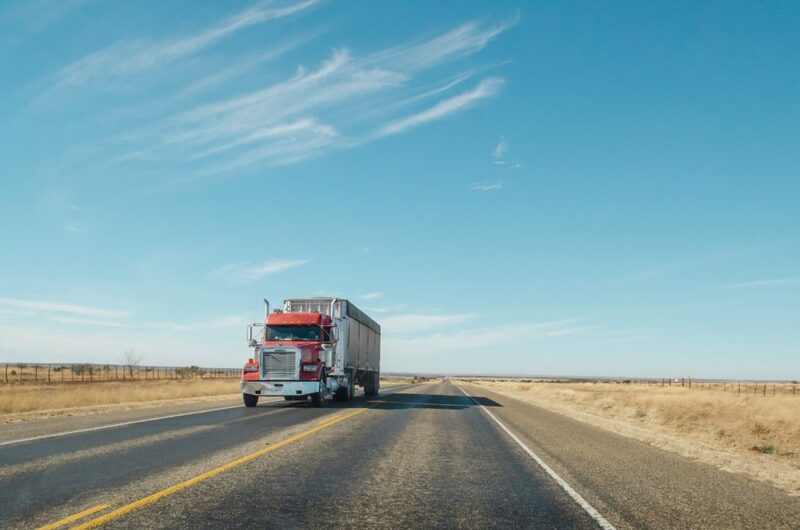 They’d look into the car as they passed, commenting to everyone with a “woohoo,” or “let’s see more of those legs, darlin’.” Little did that poor girl know that all the truckers in the vicinity were talking about her. Moving freely to her tunes, she was likely feeling invisible inside her boxed enclosure. I learned about runaway ramps located off steep inclines for trucks whose brakes were failing. I learned about the frequency of torn tires and the need for replacements. I also learned the silent ways that truckers communicate by blinking their lights once to tell a truck behind them to go ahead and pass, and blinking twice as a way to say thank you after getting in front, if you were the truck that did so. 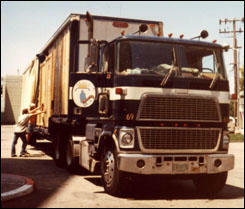 A trucker’s log book identifies the drivers, the truck owner, the type of truck and the commodities being shipped in its trailer. It also tracks the location and miles for every 15 minute interval of time, whether on or off duty, and throughout every 24 hour period. (This is because there are strict laws regulating how much time a trucker can drive between rests. A faulty log book can result in harsh fines and even prosecution.) After the officials checked the documents and found them to be okay, which was most of the time, Mark would drive onto the designated scale markers on the ground. Each axle would be weighed to ensure compliance with state law maximums and a red or green light would indicate whether we’d need to pull over for further inspection or were free to move on. 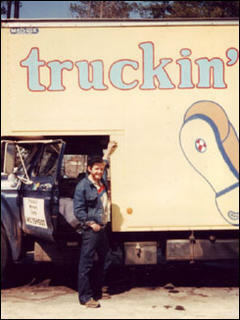 When Mark first started driving for Truckin’ Movers, they only owned small trucks, so we were accustomed to riding together on those long vinyl seats that ran across the cabs and rattled along with the truck engines. When he graduated to the 18-wheeler, it felt like we’d become freeway royalty, bouncing with soft air suspension above everyone, in big comfortable easy chair thrones. The first couple of times we rode in those trucks, we’d inevitably break into British accents, pretend waving as if on a parade, “greetings to the minions.” When I rode along with him on multi-day trips, we generally stayed in motels overnight, but when he was alone with the big rig, he’d park at the large truck stops and sleep in the sleeper section of the cab, occasionally awoken by truck stop prostitutes knocking on the cab door to see if he might need anything. One time, we were hit by a horrible storm in Alabama. I usually helped him by tracking inventory of the items being moved, but that day, I helped him load the truck as well. He was solo and the weather made the work even more grueling. The shipper couldn’t have been nicer and didn’t balk about the trucker’s girlfriend helping him load. After we finished loading, it was after dark and we were frozen to the core. We drove to a motel, took long hot baths and buried ourselves under the blankets, our bodies aching from head to toe. 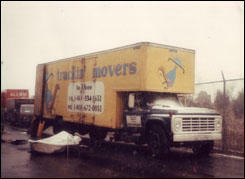 Another time, we unloaded a truck in San Francisco, where Glen, Mark’s “humper” (that’s the actual job title used for the person who assists the main driver/loader in the moving business), literally humped the client in her bedroom as we inventoried and unloaded her furniture on the floor below. She came downstairs with a wide grin on her face and when we were done, she took us all out for pizza. Mark and I enjoyed all the adventure and independence that came with life on the road. We enjoyed it so much, in fact, that we seriously pondered buying our own truck and taking a year to live and work on the road as independent owner/operators after I graduated from college. That didn’t come to pass, but it remained a dream for some time. When I’m on road trips and I pass big trucks on the highway or on long country roads, I consider my brief sojourn into that world and smile. Sometimes, I blink my lights to offer a trucker the chance to pass me, or as a way to say thank you for letting me do the same. Tokyo Rose says hi. Over.